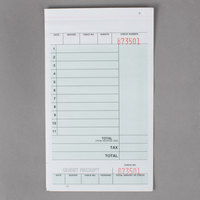 Some of our restaurant checks come with a receipt stub that can be detached and given to guests at the end of their meal. 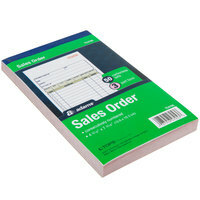 We also have scratch pads that offer you and your employees a blank canvas to write down orders, reminders, and lists. 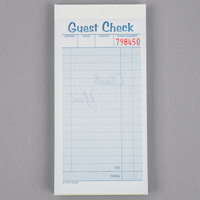 Restaurant guest checks can even be used to jot down take-out and delivery orders, so your establishment can continue to stay organized. 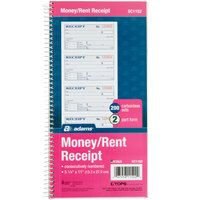 Also make sure to check out other great items from Choice, Adams, Rediform, Royal Paper and TOPS. Whether you run a fast-paced diner or a high-end restaurant, it’s important that you have an organized system for your orders. 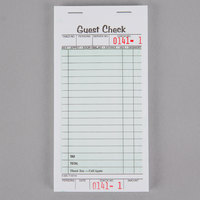 Restaurant guest checks provide a structured way for your serving staff to write down customers’ orders, which will help to ensure accuracy in your kitchen. These products are available in a variety of bold colors, like blue and green, so your back-of-house employees will be able to easily read orders. 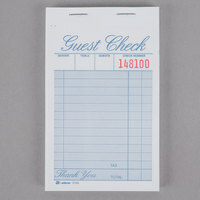 Restaurant guest checks are even available in different binding options and styles, making it simple to find the best one for your establishment. For more disposable products, check out our take-out bags, colored paper placemats, and round deli combo bowls and lids. 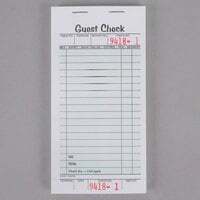 If you're wondering where to buy adams guest checks, we have a large selection of adams guest checks for sale at the lowest prices.